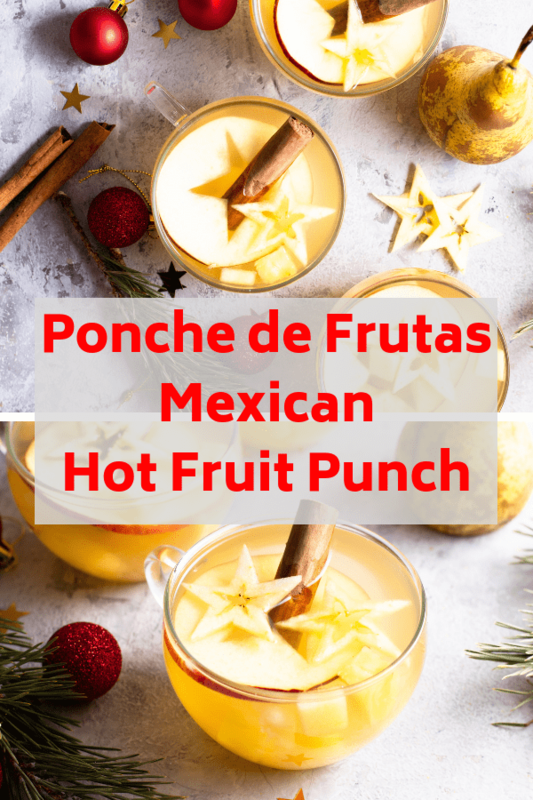 A hot fruit punch or ponche de frutas is a must-have during the holidays in Guatemala. Not only does a steaming mug of fruit punch warm you up ( and yes it does get chilly in the highlands of Guatemala and Mexico), but the spices and fresh fruit make it a deliciously fragrant drink to serve. It’s most often served with tamales or with champurradas, the traditional Guatemalan cookie that’s a bit like biscotti and perfect for dunking into hot drinks. In Guatemala, people take nose-to-tail dining seriously when it comes to meat. For example, it’s not uncommon to see a pot of blood boiling on the stove for moronga salsa or a whole pig’s head for revolcado stew. They take the same enthusiastic approach to eating every last bit of fruit. So, I wasn’t too surprised when my sister-in-law Lorena stopped me in the middle of making ponche de frutas — a holiday fruit punch enjoyed at Navidad and on New Year’s Eve throughout Mexico, Guatemala and Central America — to stop me from throwing away the pineapple skin. “You’ve got to boil those cáscaras,” she said, taking the pineapple husk and the plantain skin and putting them into a separate pot to boil. As it turns out she’s right! Pineapple skin is packed with bromelain, a powerful enzyme with anti-inflammatory and healing properties. 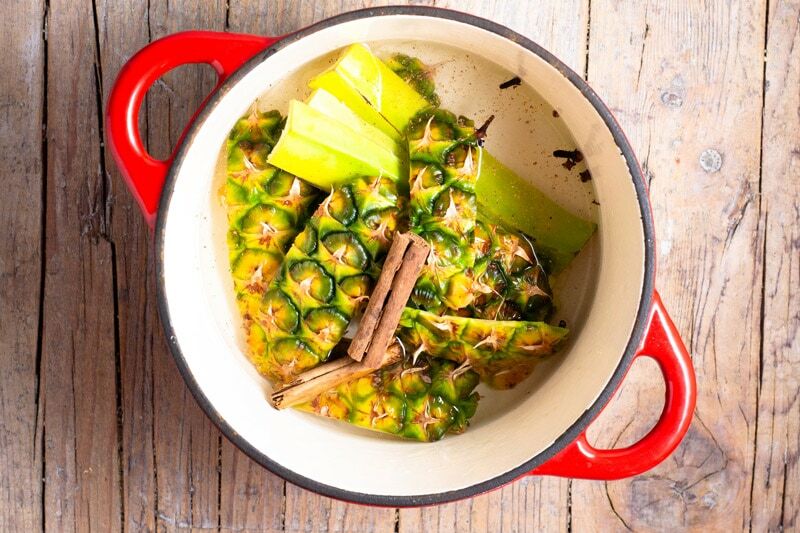 I haven’t seen many people using the pineapple skin in ponche de frutas ( or other dishes for that matter!) so perhaps it’s a unique Guatemalan tradition or one peculiar to our family. But I have to admit that eating every part of the fruit does make a big difference to the taste of the ponche and it is satisfying not let any bit of fruit go to waste. So, while I haven’t yet gotten on board with the carnivore side of nose-to-tail dining in Guatemala, I say bring on the fruit compost when it comes to fruit punch. Be sure to give it a try when making this recipe! So, apart from pineapple rinds, what other ingredients go into making ponche de frutas? Basically whatever fruit is seasonal. 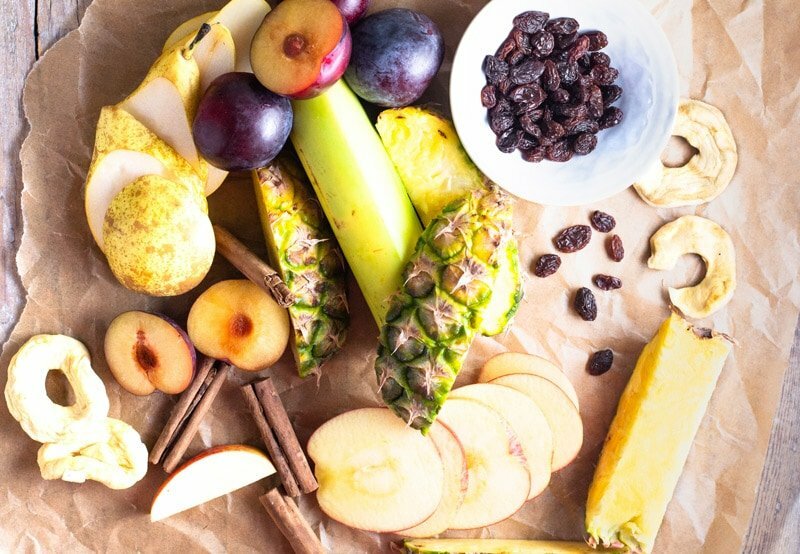 Typically, it will be an assortment of apples (fresh and dried), plums, prunes, pears, raisins, plantain and sometimes coconut plus spices. Wash the pineapple and plantain throughly. Then add to a large pot, bring to a boil and simmer with the cinnamon stick and cloves in a large pot for at least 30 minutes. 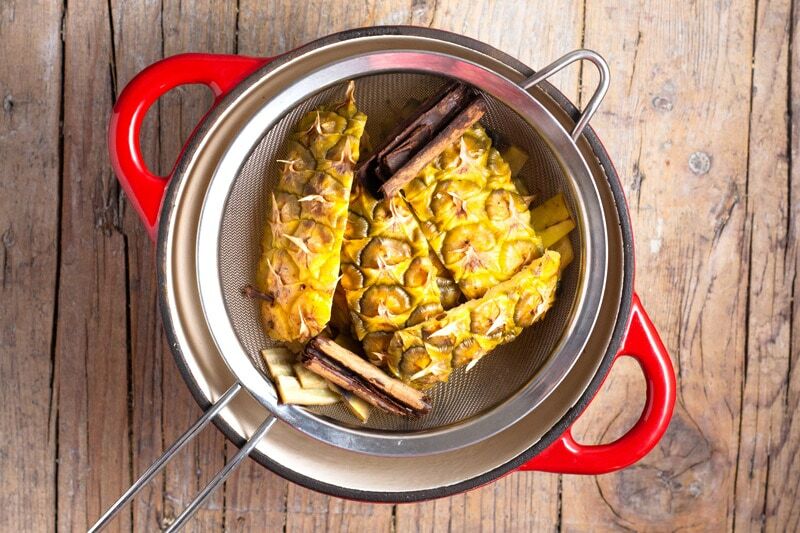 Don’t throw away the skin of a pineapple – use it for ponche! Once it’s simmered for 30 minutes, strain it and reserve the liquid and cinnamon stick. You can now discard the skins and cloves. Add six cups of water and sugar to taste to the pineapple/plantain water. I use much less sugar than is traditionally used in Guatemala so I suggest you begin with half the amount called for in the recipe and then add more according to taste. 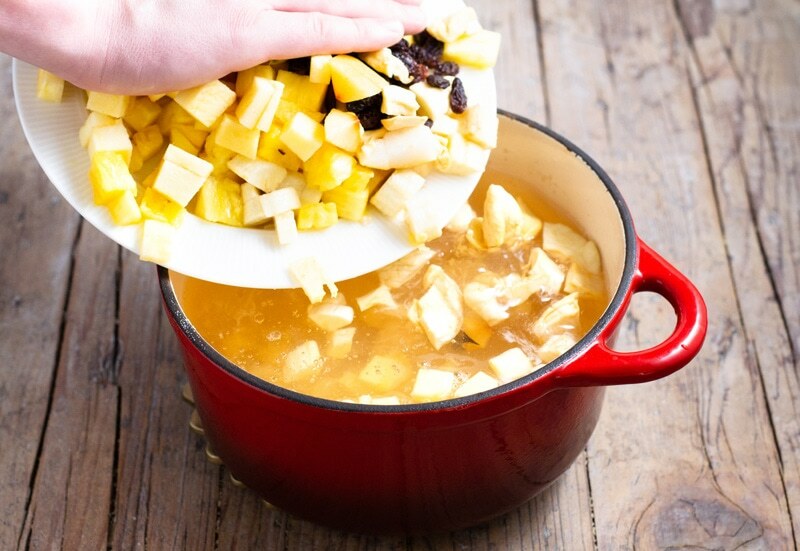 After cleaning and preparing the remainder of the fruit, chop it into small pieces and add it to the liquid in the pot. Simmer for 30 minutes until the fruit is tender but not mushy. Grate fresh nutmeg when ready to serve. 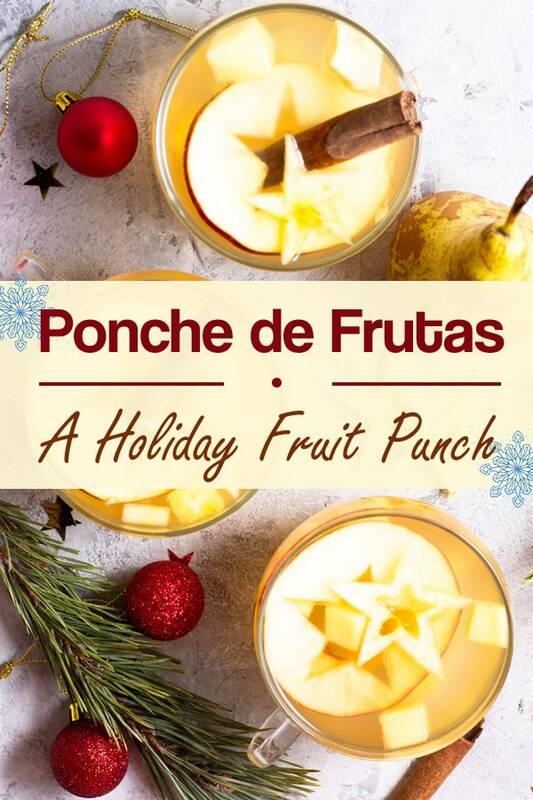 Keep your ponche de frutas warm on the stove or in a slow cooker, so it’s ready to serve to friends and family who stop by. 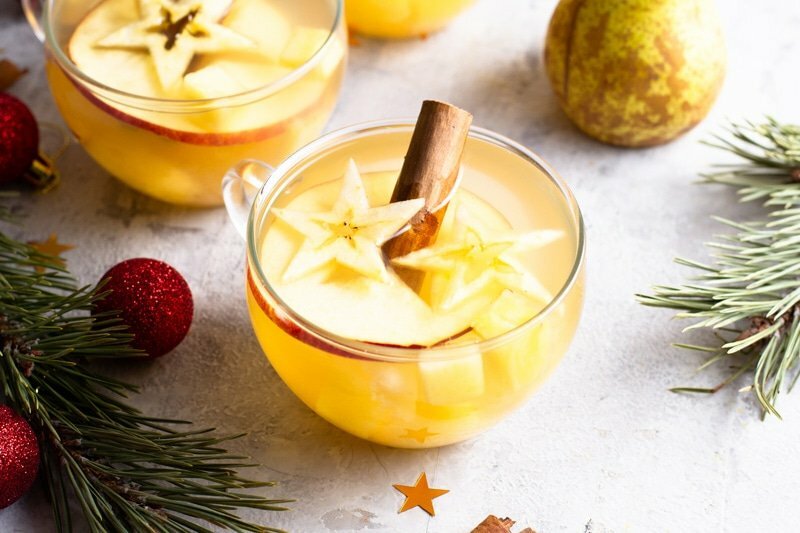 Store ponche de frutas in the refrigerator for up to three days. 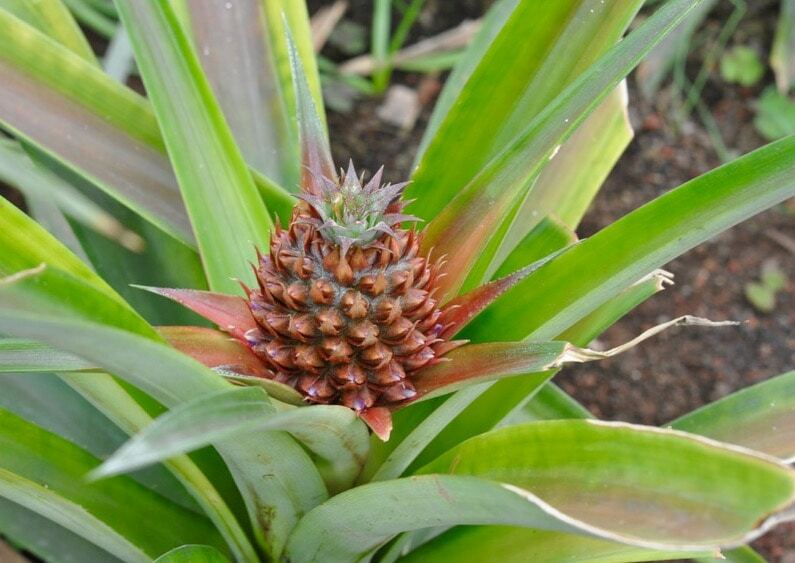 Don’t consume the exterior leaves or thorns of a pineapple plant as they contain sap which can be irritating to the skin and toxic in large quantities. If you can’t find plantain, you can substitute a banana that’s not overripe. Using neglected bits of fruit is also the key to success in other Guatemalan dishes such as Platanos en Mole, where the husk of the plantain serves as a thickening agent. A hot fruit punch made of fresh and dried fruits served at Christmas and on New Year's Eve in Mexico, Guatemala and Latin America. Spike it with dark or white rum if you like. You can use any mixture of fruit but pineapple, plantain, and pineapples are musts. Finely chop the pineapple and plantain into small pieces, reserving the husks. Set fruit aside. Bring 2 cups of water, the pineapple husk , the plantain skin and the spices to a quick boil, reduce the heat and simmer covered in a small pot for 30 minutes. Strain out the husks and spices, discarding all but the stick of cinnamon. 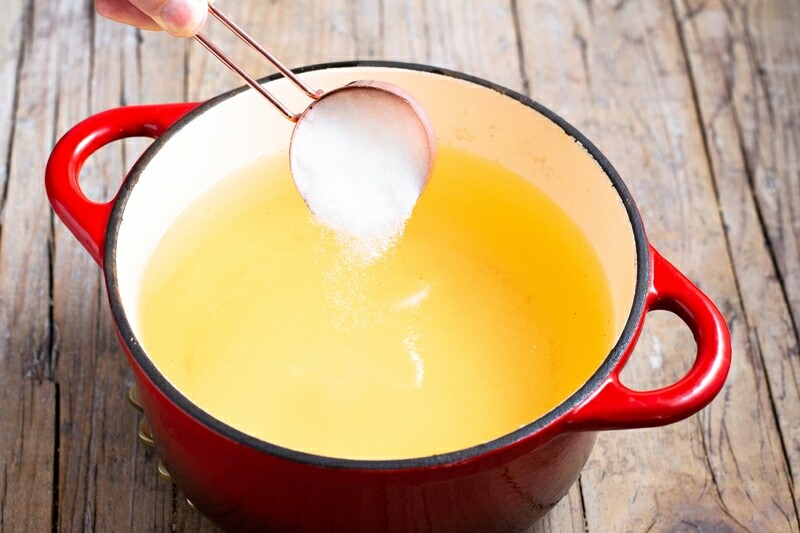 Pour the boiled fruit juice into a large pot, adding the remaining six cups of water and sugar. Add the diced pineapple, plantain, fresh fruit, raisins and cinnamon stick to the water in the pot. Bring to a boil and simmer for 20 minutes. Adjust the sugar and spices as you like. Serve hot in mugs with bits of fruit in each. Interested in more about Guatemalan and Mexican holiday cuisine? Sign up for the A Taste for Travel newsletter or check out my post on Tamales: the soul of Navidad. 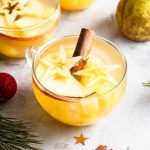 I wouldn’t have thought to use pineapple husks or plantain peel in anything, but the holiday punch looks delicious. On a more philosophical note, there may be a lesson here about what we discard or overlook in life. Healthy? What’s that? This sounds like a delicious beverage. Now there’s a drink that will truly deliver a punch especially with a shot of rum. A good way to get one’s vitamins! I’d love to taste this but don’t think I’ll be making it. The hot fruit drink sounds delish and I love the phrase “nose-to-tail” dining! But I’m with you – no entrails please! Feliz ano nuevo! When US chef’s say they’re nose to tail or what I call nose to toes- I don’t think they get into the blood and guts, but maybe they do. I think I’m more farm-to-table! 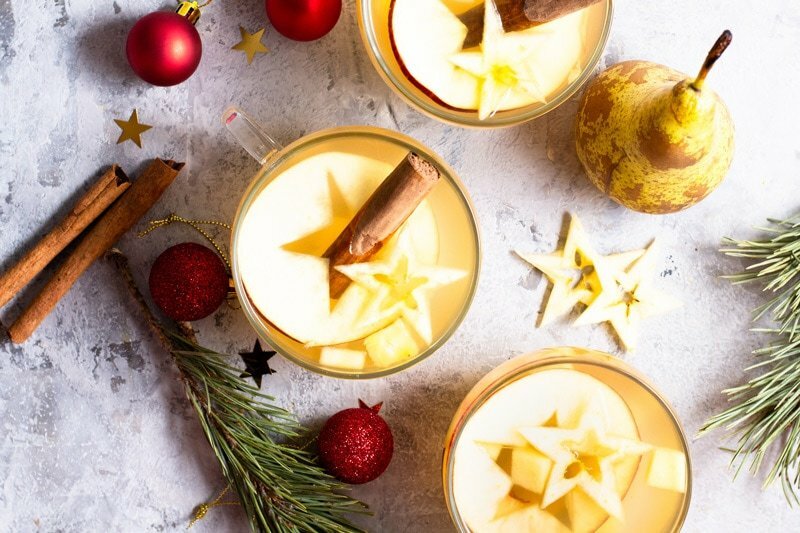 I’m not a fan of rum but this cocktail seems so fitting for the season! Best wishes for the New Year, Michele! I don’t “do” kitchen, but I really enjoyed learning more about Guatemala and how they prepare food — and punch!! Great to hear I wasn’t the only one who’d been throwing pineapple skin away!